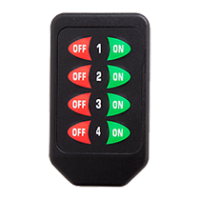 The DS Keyfob transmitter is ideal for general-purpose remote control and command applications requiring a small form factor transmitter. The small transmitter has a line of sight range of up to 750 feet (230m). It is available in 418 (standard) and 433.92MHz. It has been pre-certified for FCC Part 15, Industry Canada, and European CE (433MHz only) compliance, reducing costs and time to market. 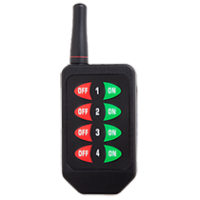 The Compact Handheld transmitter is ideal for general-purpose remote control and command applications requiring a small form factor transmitter. 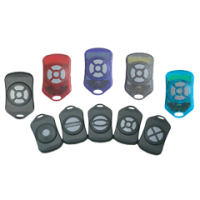 The small handheld transmitter has a line of sight range of up to 750 feet (230m). As a part of our DS Series OEM family, it is available in 315, 418 (standard), or 433.92MHz. It has been pre-certified for FCC Part 15, Industry Canada, and European CE (433MHz only) compliance, reducing costs and time to market. Addressing is based on 10 address lines that are set with a DIP switch, which offers 1,022 unique addresses. The Long-Range Handheld transmitter is ideal for general-purpose remote control and command applications requiring extended transmission distances. The stylish Long-Range Handheld transmitter features a small external antenna which allows up to 1,000-foot (300m) transmission ranges line of sight. As a part of our DS Series OEM family, it is available in 315, 418 (standard), or 433.92MHz. It has been pre-certified for FCC Part 15, Industry Canada, and European CE (433MHz only) compliance, reducing costs and time to market. Addressing is based on 10 address lines that are set with a DIP switch, which offers 1,022 unique addresses.